Spiegelgracht Juweliers ROLEX TRADE-IN GUARANTEE allows you to receive full value of what you paid for your pre-owned Rolex timepiece towards the purchase price of another timepiece, minus the service charges. It is applicable 3 years from the date of purchase. 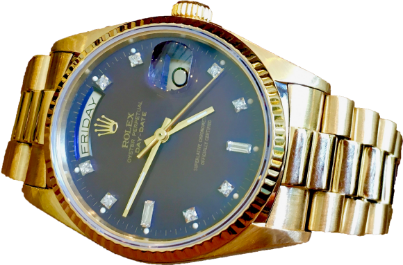 Trading-in your Rolex is a great way of owning multiple, different watches over the years and getting closer every time to your most revered Rolex watch! ROLEX TRADE-IN GUARANTEE applies only to Rolex watches 3 years from the date of purchase, minus the service charges. The price of the new purchase must be at least 1/3 greater than the cost of your trade-in timepiece. The invoice of your trade-in timepiece is mandatory so that we can check if you fulfill the TRADE-IN GUARANTEE conditions. You can trade in maximum one Rolex watch for a new one. The TRADE-IN GUARANTEE applies only to Rolex watches that were purchased from Spiegelgracht Juweliers. The trade-in timepiece must be returned without any damage or modifications and be in good working order. If we find the watch to be in bad condition (water damage, missing parts, worn out/stretched bracelet), we retain the right to refrain from trading in.